ELM Enterprise Manager is more than just a baby-sitter. 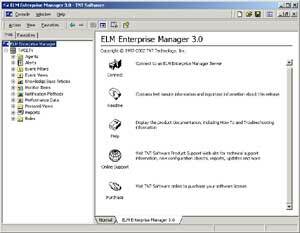 ELM Enterprise Manager, from TNT Software, allows you to monitor all your servers from a single console. Not only that, but it automates or enhances many of the monitoring capabilities built into Windows NT and Windows 2000, although you can monitor non-Windows servers too. It also has archiving and reporting functions for the data collected from your servers. There are many reasons why I like this software-a lot. It's simple to install and extremely easy to use; the documentation is well organized, understandable and a nice manageable 49 pages. I spent a lot of time trying to break it or get inconsistent performance and couldn't. Not even once. Also, when I sent a support request via e-mail to TNT software, I got a helpful response less than a half-hour later. This was for an unregistered evaluation version of the software. Finally, everything about the product gave me the impression that the developers who built it paid a lot of attention to detail and let their QA folks go over it thoroughly. ELM Enterprise Manager consists of three parts: the server, which is where the data is collected and stored; the console, which is where you view and manage the ELM server; and the agent, which monitors the servers you want to keep tabs on and sends information to the ELM server. The console and server can be on the same or different PCs. The installation process is clean and simple. The default installation installs both the server and console, prompts for a service account and gives login as a service right to that account. Installation requires MDAC 2.6 Service Pack 1 or greater; if you don't have it, you're prompted to download it from Microsoft's Web site. After installation finishes, the Database Connection Wizard launches and you're prompted to specify what type of database you want to use for data collection. The only quirk I found was that, if you're using SQL Server, the Database Wizard doesn't create the database automatically. You have to manually create a blank database, then resume the wizard and specify the database name. Note: While I used SQL Server for my testing, ELM is also supported on Access, MSDE and Oracle. After installation, a wizard walks you through selecting the servers you want to monitor and what type of agent you wish to use. There are three types. I tested the Service Agent, which consists of a small .exe and associated .dll files that are physically installed on the monitored server. You can install it from the ELM management console, and you don't have to reboot the server afterward. I haven't had good luck with software agents in the past and was semi-dreading testing that part of the software ("Which PCs do I want to fry today?" Yes, I use Ghost but I still don't like rebuilding machines). I was convinced that if the program was going to get flaky, this is where it would happen. Fortunately, from my workstation, I installed the service agent on multiple test machines without a problem. I then installed it on a production server. There was no noticeable impact on performance, and no strange issues cropped up after the agent was installed. I was also able to easily test, disable or delete the agent-all from the ELM management console on my workstation. If you don't want to install anything on the servers you want to monitor, you can use the Remote Agent. This works by polling from the ELM server at regular intervals and adds some network overhead. Finally, you can also use an IP Agent, which, unlike the Remote Agent, isn't specifically Windows-based. The IP Agent is used to check the status and availability of IP services such as ftp, http and so on. All agents worked fine. Set up customized e-mail (or pager, Net Send, custom beeps and so on) notifications for several servers and several different events in one place. You can do this in Windows, too, but it's a much easier process in ELM. One nice touch is that you can test the alert by pressing the Test button rather than having to trigger the alert condition. Track when a server process starts and stops. Set up notifications to occur if a Web page has been modified. Monitor response time for Web, ftp and SMTP servers and send a notification if they're too slow. Schedule SQL queries to run and send notification if the results aren't what they should be. And the best thing about it is that it's not any more complicated than it needs to be. 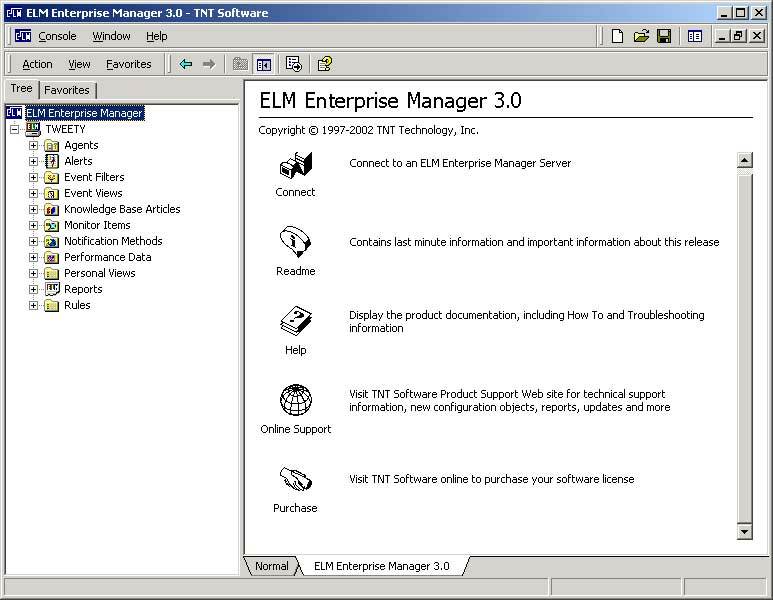 All in all, ELM Enterprise Manager is a well-designed and solidly built and supported product. If you're looking for a monitoring solution, it's well worth your time to consider it. Suzanne Pacheco is the IT Manager for Micro Information Products in Austin, Texas. In her spare time, she and her husband John play golf and try to keep their three labradors entertained.